Jimmy Ford Wetherington was welcomed into the presence of his Lord and Savior Jesus Christ on November 1st, 2018. 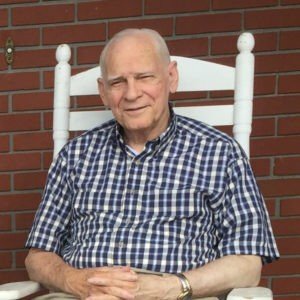 Born on January 22, 1934 to Samuel Arthur Wetherington and Cordie Collins Wetherington in Ray City, Georgia, he was preceded into Heaven by his wife of 58 yrs, Corene Croley Wetherington, in 2013. Jimmy and Corene leave behind four daughters and their spouses, Joan St. Jacques (John), Melanie Parker (Tim), Nancy Davis (Ken) and Julie Joyce. Jimmy’s brother, Remer Wetherington, preceded him in his passing. Jimmy’s intelligence and curiosity, combined with his skill as a machinist, caused him to ponder and create many interesting mechanical devices and solutions, including building his own home many years ago. He was always working on something in his mind, even when his body began to decline from asbestos exposure during his Naval days aboard the USS J.D. Blackwood. Jim and Corene valued their shared friends and faith at First Baptist Church of Gainesville after his conversion and baptism in 1981 and could often be found reading and memorizing Bible passages together. Jimmy especially loved to laugh, play pranks, and joke with his grandchildren David, Jonathan, Lauren, Brooke, Seth, Ryan, Miles, Kaitlin, Caroline and Carson and great grandchildren, Elijah and Charlotte. A visitation (10:00am) and celebration (11:00am) of his life will be held on Saturday, November 3rd at First Baptist Church of Gainesville, 14105 NW 39th Ave. Internment will be held on Wednesday, Nov. 7th at 2:00 pm at Forest Meadows Memorial Park West on County Road 241 Jonesville, FL. In lieu of flowers, donations may be made to First Baptist Church of Gainesville. Arrangements are under the care of Forest Meadows Funeral Home, Gainesville, FL.